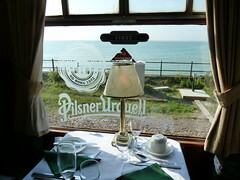 Train Chartering operated The Pilsner Urquell Express to and from the British Open 2011 at Royal St. George's Golf Club for Essentially, the leading sports marketing agency. 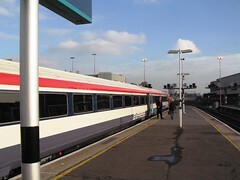 The trains ran between London's Victoria Station and Deal Station, from where there was a short coach transfer to and from the course. 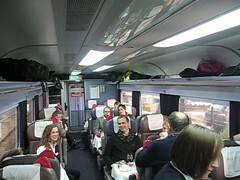 VIPs were served a full English cooked breakfast and a 3-course dinner on the train, which was chef-prepared in the train's kitchen and served by uniformed stewards. 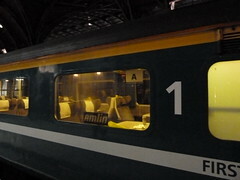 The train was branded with Pilsner Urquell logos in the windows, Pilsner Urquell headrest covers, various items of Pilsner Urquell's point of sale materials and, naturally, bottles of the well-known light beer. Each of the 6 journeys over three days was completed on time or early. CORPORATE GROUP & MEETING TRAIN TRAVEL SERVICES Train Chartering manages private train charters, private carriages and escorted group travel seats for corporate travel as well as hospitality and incentive travel worldwide. Private train charters are a superior, cost-effective way for VIPs or larger groups to travel to and from any event. Be it luxury group rail travel for a corporate hospitality event, group travel to meetings, conferences and exhibitions or using a train as a meeting venue in its own right - we will organise everything for you. CORPORATE HOSPITALITY & SPORTS TRAVEL From rugby to Ryder Cup train travel, Royal Ascot to St Andrews, America's Cup to the FA Cup Final, we've organised private train charters and carriages of every description to many major sporting events. VIP & BUSINESS INCENTIVE TRAVEL Train Chartering are specialists in organising luxury train travel for groups of every size. Ranging from private train charters for special events in the UK, to private carriages, escorted group travel and individual seats almost anywhere in the world where trains operate - private rail car charters offer you an unmatched level of luxury and possibility. 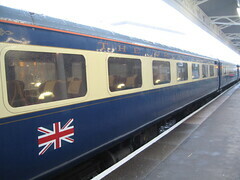 Train Chartering supplies branded trains for corporate and private clients as well as for tv / film production companies. Still probably the most exciting international train on the most significant routes anywhere in the world, private Eurostar trains are available from Train Chartering. 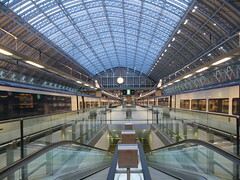 Train Chartering and Private Rail Cars also offer private carriages on scheduled Eurostar services. High capacity charter trains for up to 700 passengers are available from Train Chartering and Train Hire. 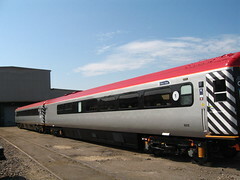 These are made up of Standard (2nd) Class carriages to achieve the capacity in a train that does not exceed the allowable maximum length on the railways. However, since all the seats in these carriages have a full-size table (rather than being airline-style with flip tables), there are many opportunities for upgrading the accommodation to a Club Class experience, if this is required. Train Chartering supplies private train carriages on most railways, such as this First Class carriage from London. The passengers were being treated to a mystery journey by their employer, with Thornbury Castle in the English countryside as the final destination. A 2-course lunch with wine was served en route, and a singing waitress made a surprise performance. Transport Charter (part of Train Chartering) organised the transfer to and from the castle in a fleet of Mercedes Vito executive people carriers.